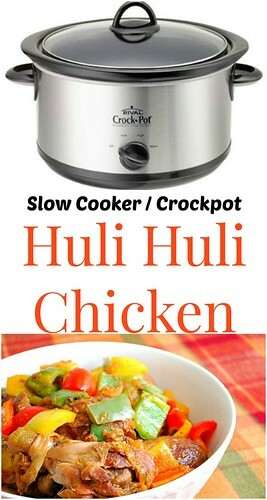 Article first published as Huli Huli Chicken on Blogcritics. The sauce includes crushed pineapple, brown sugar, ketchup, lime juice, soy sauce, garlic and ginger. It may seem like an odd combination but trust me... over time, this concoction will create something pretty delicious. For fellow gluten free foodies, I used tamari in place of soy sauce. You can also use liquid aminos as well. I adapted this recipe by using crushed pineapple and adding some color with the addition of colorful bell peppers. Rather than broiling the chicken to finish after braising, I served it as is with its juices over steamed rice. 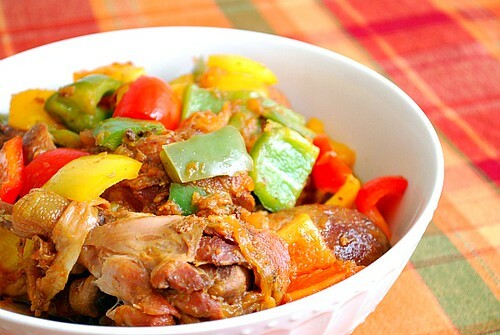 It was very similar to a sweeter version of the popular Filipino Adobo. This is another dish you can prep for a make ahead slow cooker meal (directions included below). Simmer crushed pineapple, brown sugar, ketchup, lime juice, soy sauce, garlic and ginger in medium saucepan until thickened and measures 1 1/2 cups, about 10 minutes. Season with salt & pepper. Coat slow cooker with cooking spray. Transfer sauce to slow cooker. Season chicken with salt & pepper, add to slow cooker and coat evenly with sauce. Cover and cook until chicken is tender, 4 to 6 hours on low. About 30 minutes before the chicken is done, heat a skillet over medium high heat. Add oil and when hot, add bell peppers. Sauté peppers until slightly softened and then transfer to the crockpot. Stir to combine and allow to finish cooking with the chicken. Serve in a serving dish with juices. * To make ahead/freezer meal: Prepare the recipe above as directed. Instead of transferring the ingredients into a slow cooker, place in a gallon sized freezer bag. Remove excess air, seal and freeze. When ready to prepare, defrost bag completely and place into a slow cooker. Cook 4 to 6 hours on low. Wow. Sounds good. I think I might need to have Blake make me some of this yumminess! Give me a call when you're in Hawaii for good. I'm also going to retire there! You're my hero! Lived on Oahu for several years (son was born there) and now on the east coast. Our two fav meals from there are Huli huli and Kalbi beef. Making this chicken this week. Is there a kalbi recipe here I need to search for?? This sound yummy must try it. One question, you say you reserve the remaining cup of sauce but never tell us what to do with it.